When it comes to rain water tanks, Heritage Water Tanks offers you the best choice, at the most competitive price without compromising service or quality. Heritage Water Tanks are built in Australia, made by Australians and are at the cutting edge of water tank design and manufacture. We are both innovators and trailblazers in the Steel -Liner Water Tank Industry and are proudly Australian owned and operated. An icon of the traditional rural Australian outback, large steel rainwater tanks are also increasingly seen in use on commercial properties and mine sites and as Fire Water tanks throughout the country. 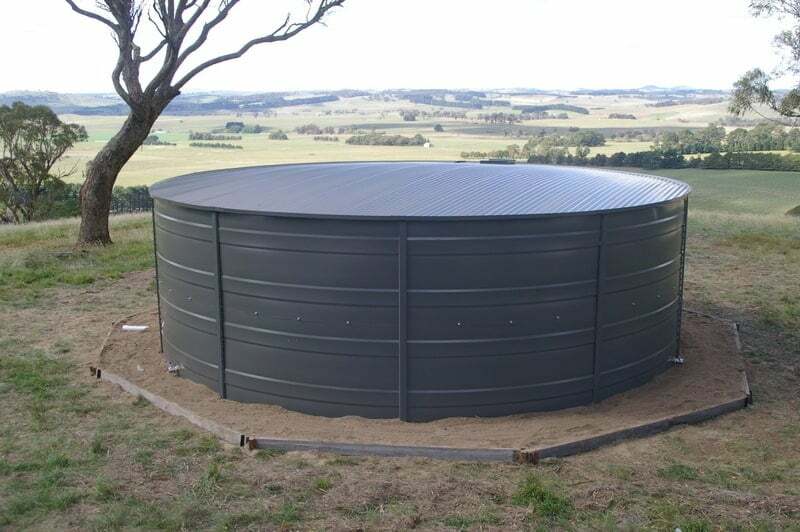 Heritage Water Tanks offers both Corrugated and Streamline profile options made with 1mm BlueScope steel, with domestic and rural tanks ranging from 17,000L to 375,000L. With humble beginnings, Heritage Water Tanks was founded by two country boys, who saw the need for superior quality water tanks in Australia and knew how to achieve the very best. Founding Directors Murray Tognela and Brian VanRooyen knew from their own experience that there was a huge need for a water tank product that was built for the harsh Australian environment. With these simple goals in mind, they set out to find suitable materials to design a water tank that was built to last and to perform in the harsh Australian environment. Another special attribute that sets Heritage Water Tanks apart is the exclusive Heritage Tanks ArmaFresh Water Tank Liner. A water tank liner that is unique in its material design and manufacture, which is assembled in one-piece using heat-welding technology. Mr Tognela explained that our liners will not delaminate or weaken over time, as any joins in the liner are fused together, giving the liner extraordinary durability and strength. “This is why Heritage Water Tanks can stand by their water tanks and place a 20-year conditional warranty on them,” he said. Heritage Water Tanks supplies a large network of carefully selected agents throughout Australia. All of our agents have trained installation teams available to install your new water tank and to give you peace of mind in knowing that the tank is being installed by experts. To find out more about Heritage Water Tanks please feel free to contact us on our Free call Number, 1800 115 552 or fill in our request for quote form.